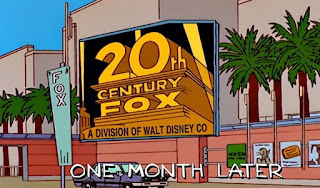 19 years ago, the splash image above was a still from a Simpsons episode. 'Nuff said? Fox’s interests in Hulu*, Sky, and Endemol Shine Group. *a 60 percent stake in Hulu. And untold hundreds of other franchises. Do you remember when Logan was going to be Hugh Jackman's last run at playing Wolverine? Last week he (may have joked) said that if Disney buys up Fox, he would consider returning. Wow... that says a lot about how Fox ran things! But with this new deal, Disney now has a ton of new Marvel character righs back under their belt and sure enough, a few quick announcements were made today. "We have the opportunity to expand iconic franchises for new generations of fans just as we have done with Marvel and Star Wars… We’re also looking forward to expanding the Marvel Cinematic Universe to include X-Men, Fantastic Four and Deadpool." 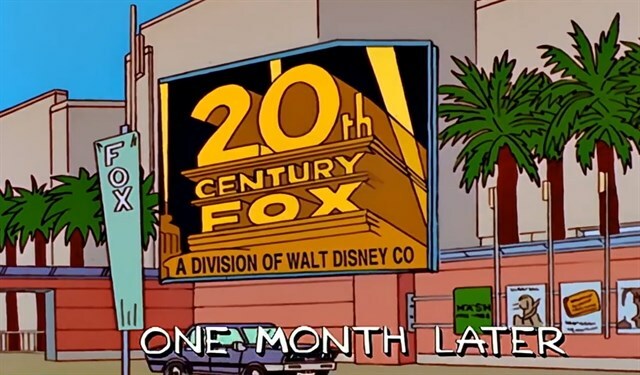 But then there are shows like The Simpsons, whose ratings have been pretty lack-luster and knowing how sharp Disney is in making a dollar, this show may not fulfill that quota any more. Industry experts expect the show to come to an end pretty soon now. No? Oh yes. Sure, present-day fans might balk, but those fans are a drop in the bucket. And if you remember, the moment they took over Lucasfilm, they ripped the Star Wars animation show right out from under Cartoon Network. How Marvel Was Restricted By Fox Owning The X-Men Character Rights? So one detail to note is that with Fox owning the X-Men, that ownership included mutant super powers. In other words Marvel could not have any true mutants under it's wing. If you think about it, any "mutant-like" character in a Marvel film was made by science or messing with alien technology. With Fox's rights back in the house, they can now freely introduce true, genetic-based mutants. With this purchase looking to take place, there's the argument that this is also related to Net Neutrality (NN) being abolished on the same day this was announced. I'm not sure that's cogent to the deal but the argument is that with NN gone and Disney finally snagging up Fox properties, they will own all the avenues of internet access to this content. And that's a huge thing. If this NN-getting-cancelled thing doesn't get repealed. And many believe it won't because our PODUS is pretty business-oriented. But this is going down an entirely different path. So as it stands, we may now start seeing some new films with new characters (for Disney/Marvel) and the potential improvement of these power-house comic title franchises. It seems pretty exciting on the surface, and that's what Disney wants you to believe! So we'll more than likely run with that! Below is the detailed press release with some great verbiage of how this will all benefit you, spending more millions on their new stuff, helping them make more billions, while, yes, benefiting you! (I'm being pragmatic here. Nothing more, nothing less.) BECAUSE KEEP IN MIND, that Marvel is just one tiny piece of this pie. With this acquisition, Disney is going to have a HUGE inventory of content they will be able to offer from or restrict to, their new, upcoming streaming service. “Content is the weapon of choice in this over-the-top game. Crafty Disney can use content offensively and defensively. It can withhold its treasure trove of content and characters … from Netflix, or use some of the biggest brands in the world, the biggest franchises — Star Wars, Pixar, Marvel, now maybe X-men is another one — to its advantage.